Got Morning Sickness? Check out Gag Bagz | Breezy Mama Breezy Mama - Expert parenting advice, celebrity interviews, product reviews for kids, moms and babies and more! Okay… don’t hate me, but I am going to be honest when I say, after four pregnancies, I never once barfed. That’s not to say I never FELT like it, I just didn’t. 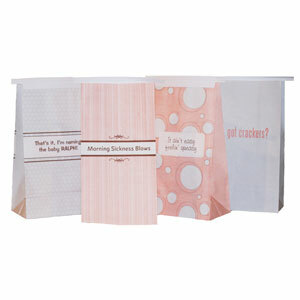 However, if you are “enjoying” a particularly nauseous pregnancy or know someone who is experiencing morning sickness, you must check out the hilarious Gag Bagz. In a packet with four sayings, moms can stash them in their purses for that “just in case” moment. Come to think of it, even if you aren’t a barfer, it doesn’t hurt to have these hilarious bags handy for the next time toddler tummy strikes your child! That’s it, I’m naming the baby Ralph! Top pick up your pack, be sure to visit: www.GagBagz.com.